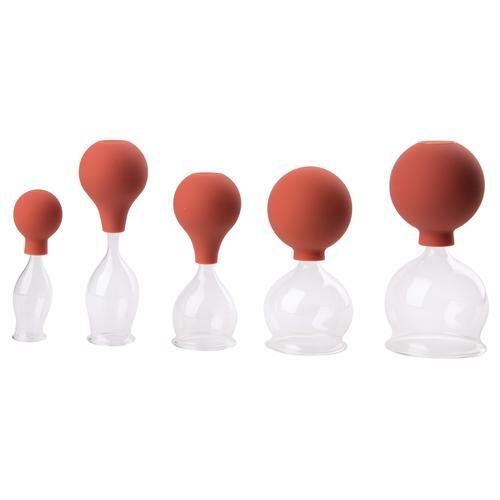 Glass cupping set w. suction bulb, 20-60 mm,set of 5 pcs. Set consisting of 5 medical cupping glasses with 5 rubber balls for fire-free cupping. The cupping glasses are made of glass so you can clean and disinfect them easily (dishwasher safe). They are hand-made in the town of Lauscha, Germany, to a very high standard. The 5 suction balls (removable), made from medical, soft PVC, are physiologically harmless, cadmium-free, and fully reusable. Place the glass on the desired part of the body. Squeeze the air out of the ball. When you let go of the ball, the air flows back into the ball, forming a vacuum in the glass, which draws in the skin. The cupping is now ready. To release the cupping glass, simply lift the side of it up carefully. The exact size of the glasses may vary slightly. Our cupping glasses are medical devices and are CE compliant. Glass cupping set w. suction bulb, 25-45 mm,set of 5 pcs. SEIRIN ® New PYONEX - 0,17 x 0,90 mm, green, 100 pcs. per box. Glass cupping set w. suction bulb, 30-70 mm,set of 5 pcs.